Black Lightning continues the runaway teen tail as Jefferson, Anissa and Gambi use all of their resources to find them before more dangerous people do. First of all I’m very aware of how late this review is. Life got in the way which meant I had to prioritise some things over others and this simply fell by the wayside. I did toy with stopping coverage altogether but I’m always compelled to watch this show and cover it in its entirety because of all the strong things it does that I feel bears weekly analysis. Since I’m three episodes behind at the time of writing the outstanding reviews might not have my usual detail but I am writing them from a position of not knowing what comes next as I’m watching them one at a time before reviewing them just as I would had the reviews been on time. 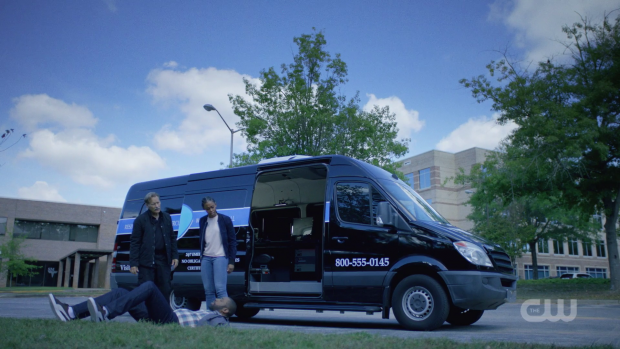 The previous episode established that Jennifer and Khalil are really bad at being on the run which perversely makes them very good at it as they don’t know the normal tricks so their approach of just winging it and hoping for the best makes them unpredictable and keeps them one step ahead of their pursuers. Immediately there’s a strong basis for tension as Jennifer and Khalil are concerned that they will be discovered by those that want to do them harm while Jefferson’s group are equally concerned that Tobias’ people will find the wayward teens before they do. From Jefferson’s perspective it’s a race against the clock to make sure that his daughter is safe and for the runaways it’s about staying far enough ahead of those coming after them to keep each other safe. They hit a snag when Khalil’s injury from Cutter’s poisoned blade starts to get worse to the point that a good night’s sleep won’t get him back on his feet again. As his condition worsens Jennifer is forced to perform a risky course of action and find him some antibiotics from a nearby hospital. As luck would have it Jefferson and Anissa happen to be in that same hospital at the same time to see the aftermath of Jennifer using her powers to break an electronic lock granting her access to the much needed medicine for Khalil. It could almost be seen as a calculated risk on Jennifer’s part though the setup makes it apparent that any decision she makes comes from a place of emotion rather than any sort of rational reading of the situation. Rational behaviour would be finding her family and explaining the situation so that they could offer her protection but for whatever reason she feels that isn’t currently an option. To her mind this is her only option which further reinforces her immaturity as a flaw to be overcome. Unfortunately the antibiotics don’t help but Cutter relentlessly pursuing them ends up playing out to their advantage as Jennifer is able to internalise her thought process by bouncing ideas off a version of herself which leads to her figuring out how to use her powers to subdue Cutter. Jennifer goes straight to torture by using one of her knives against her. The trade is simple; she gets to live if she surrenders the antidote which works allowing Jennifer and Khalil to go on their way. The way I’ve written the above suggests that not a lot happened in this episode which is certainly true but the lack of plot movement was countered by some fascinating characterisation. Khalil’s condition quickly deteriorating over the course of the episode is revelatory for Jennifer who starts to realise the extent of her feelings for him. She has said that she would do anything for him but her actions in this episode prove that she actually would do anything for him so there’s definite movement in terms of her understanding of her own feelings. 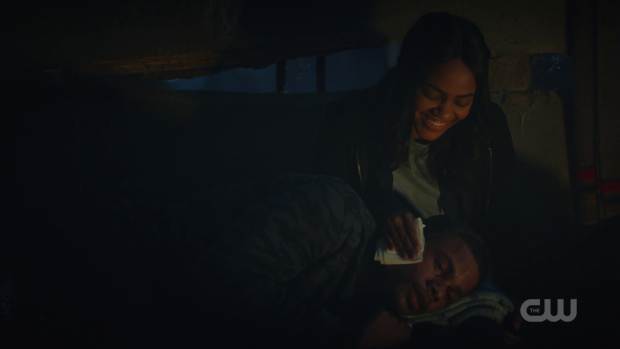 Their flirtatious banter is really charming to watch and China Anne McClain does a fantastic job exhibiting the complex emotions being dealt with by Jennifer. Jordan Calloway has the thankless chore of playing an illness which limits Khalil somewhat though he is still engaging as part of this pairing. One thing that doesn’t entirely work is Jennifer’s sudden willingness to torture. I have no problem with the idea itself but the execution was problematic as Jennifer came across as remorseless when doing so. It’s easy enough to accept that she has no love for Cutter but there should have been some hesitation considering that her upbringing instilled within her a strong set of core values. Desperation does cause people to do questionable things but the complete lack of guilt is jarring. It’s also worth noting that a big part of her characterisation this season is around her reluctance to use her powers out of fear of hurting someone. Figuring out how to use them in a constructive way took up a fair amount of time in this episode and it’s clear that she had to work up to making the attempt so that makes it more unbelievable that guilt free torture is something she was capable of. I fully accept that guilt may follow her over the coming episodes. Jefferson, Anissa and Gambi don’t have a lot to do narratively other than narrow their search parameters to the most likely hiding places. There’s a lot of discussion about what to do next and an improvised technical solution involving Jefferson’s ability to see electrical signals which is all good an mechanical but does little more than kill time for these characters because they can’t catch up to the runaway teens quite yet. 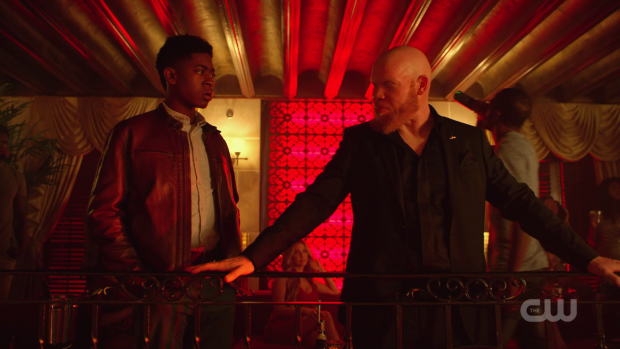 Jefferson’s frustration and Anissa’s attempt to keep a level head with Gambi somewhere in the middle is a solid enough dynamic and Jefferson’s anger builds naturally to the point where his desire to be reckless even though he has no actual plan feels earned. Lynn is a character who is all over the place at this point. Her prior emotional reaction to Jennifer running away feels out of character for her even considering the circumstances. The inconsistencies in her behaviour really stand out when she’s trashing Jennifer’s room one minute and methodically deciding to find Khalil’s father in order to eliminate one potential hiding place. It makes sense on paper but it quickly becomes apparent that it’s little more than a clumsy excuse to introduce the idea of Khalil’s brother who died because of his involvement with The 100 gang. The “one parent to another” angle works well and it’s good to see Lynn being proactive when it comes to finding Jennifer but the purpose is painfully transparent which takes away from Lynn appealing to Kito’s (Kendrick Cross) fatherly inclination to protect his son. Surprisingly this episode introduces a new character in the form of Todd (RJ Cyler); a young genius level kid frustrated at the opportunities he misses out on in favour of his less talented white contemporaries. This makes him an idea candidate for Tobias to woo with the promise of opportunities and a taste of how the other half live. I really liked this plot because I liked Todd and was rooting for him not to fall under Tobias’ spell. The episode doesn’t feature a lot of him but it’s more than enough to establish how hard he has worked and the fact that the odds are stacked against him. From a certain point of view it’s understandable that Tobias’ offer would be irresistible and it sets up the inevitable tragedy of the strings attached to this deal affecting Todd negatively in the coming episodes. It’s unclear how this ties into the overall season plot though I suspect it has something to do with Tobias presenting the appearance of legitimacy in the public eye. A strong episode that makes up for a relatively slight plot by doubling down on engaging characterisation. 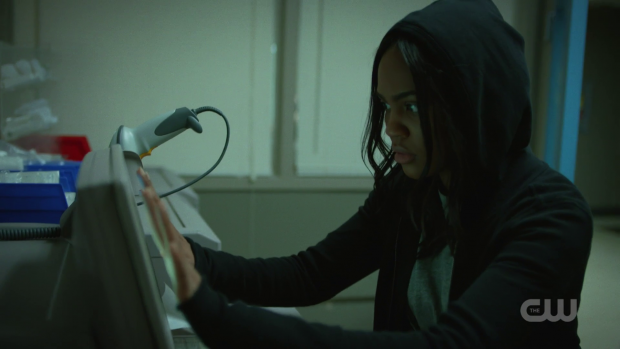 Jennifer’s realisation of the depth of her feelings for Khalil as his condition worsens works really well and is wonderfully played by China Anne McClain. Jordan Calloway has the thankless chore of playing sick but the flirtatious banter between them remains strong. There are some great touches such as Jennifer’s desperate trip to the hospital to get much needed medicine for Khalil and her internal problem solving session where she figures out how to use her powers to find Cutter. Not everything works such as Jennifer’s comfort level with torture with no apparent remorse though it’s possible this will come later. Jefferson, Anissa and Gambi spend most of their time scrambling to find the wayward teens but don’t do an awful lot when all is said and done. The dynamic of Jefferson’s growing frustration, Anissa being level headed and Gambi being somewhere in-between works really well and Jefferson’s desire to be reckless with no plan feels earned. Lynn is still a character the writers are clearly struggling to find a use for. It’s good to see her being more proactive in this episode but her behaviour at this point is inconsistent. The “one parent to another” angle works really well though it’s difficult to separate that from the clumsy excuse to introduce the idea of Khalil’s dead brother as something to be brought up later. Todd’s introduction feels divorced from the other plot but is interesting nonetheless. He’s an engaging character and Tobias’ casually manipulative approach is as engaging as ever. Despite relatively little screen time Todd is entirely sympathetic and has been set up nicely.